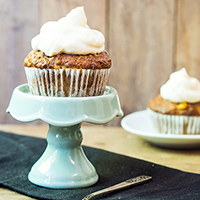 Carrot-laden muffins are always a welcome treat. Place the raisins in a bowl and cover with boiling water. Set aside. In a small bowl, combine the flour, baking soda, baking powder, salt, cinnamon, and nutmeg. Set aside. In a large bowl, whisk together the eggs and sugar. Stir in oil, applesauce, and vanilla until combined. Drain the raisins and add to the bowl. Add the carrots and mix. Pour the dry ingredients into the wet ingredients and stir just until moistened. Fill greased muffin tins 3/4 full. Bake at 350°F for 18 to 22 minutes until browned and fully baked. FrostingBeat the cream cheese, butter (or margarine), powdered sugar, and vanilla together until fluffy, about 2 minutes. Frost muffins once they are fully cooled. Store in the refrigerator.